It’s not that often that I get to share interesting ideas from my hometown, so I’m pretty excited by this! 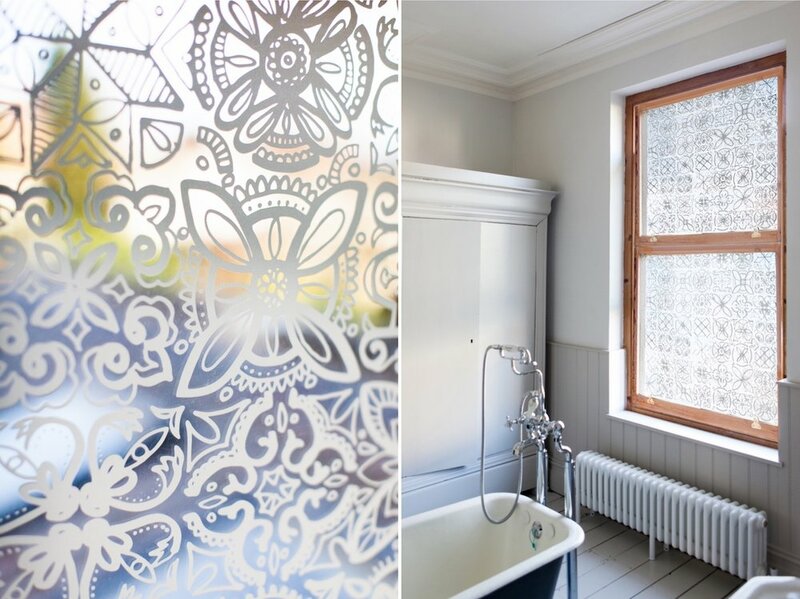 These film transfers for windows are the work of Bristol-based company Blossom & Brush. They’re a fun, contemporary alternative to net curtains or frosted glass, providing privacy without blocking out natural light. Blossom & Brush was born more or less by accident. Having searched extensively for some form of net curtains, frosted glass or blinds for the bay windows of her living room, Rhiannon Southwell had come up empty-handed. She wanted to gain some privacy from the street without sacrificing natural light, but couldn’t find anything she particularly liked. As a textile designer she has a bit of a flair for pattern, so eventually she came up with a creative solution: painting the inside of her windows by hand in a folk-inspired design. The images immediately above and below are of her living room, where her original painting remains today. 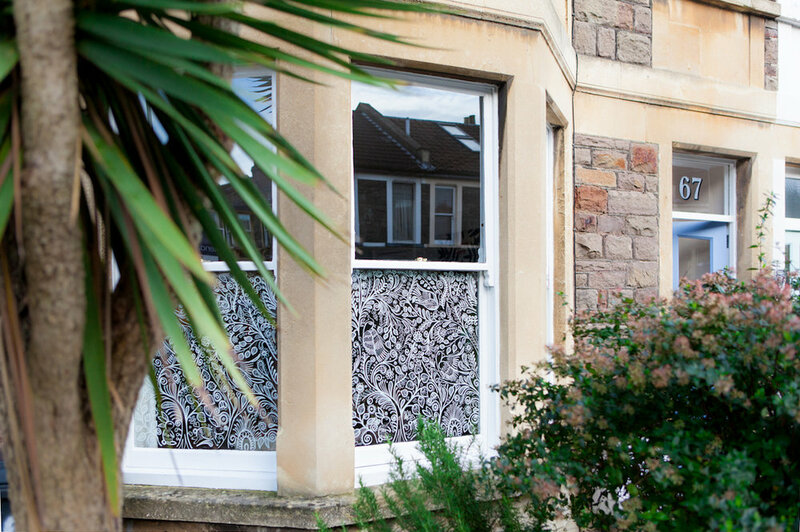 The patterned glass prompted an unexpectedly warm response from local residents, as countless passers by stopped to ask where they could buy a similar window treatment. Overwhelmed by the interest, Rhiannon decided to turn her design into a film transfer that other people could use to replicate the same look in their own homes. As such her company, Blossom & Brush, was launched in 2015. The joy of window film is its versatility. Since it stands up so well to condensation, it can be used all over the house - including steamy areas such as bathrooms and kitchens. One customer even used theirs as a shower screen! Blossom & Brush make each individual sticker to order, resizing and editing the pattern so that it fits perfectly to the dimensions of the glass. This ensures that every single one looks like a hand-painted design, rather than the pattern cutting off abruptly at the edge of the window or repeating across larger areas. I’d really recommend having a look at their Instagram, as they regularly update it with nice examples of customers using their film in interesting and unexpected ways. Over the past couple of years Rhiannon has expanded her range to include a total of eight designs. All are similar in style to the original but take inspiration from different sources, such as tiles, henna tattoos and flowers. To see the full set, take a look at the website. All images courtesy of Blossom & Brush.